The WAN has always been about connecting users to applications and moving data, but the playing field has now changed with datacenters migrating to the cloud along with missioncritical applications. Companies are increasingly moving away from traditional applications and the notion of a location is changing. 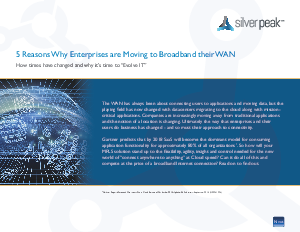 Ultimately the way that enterprises and their users do business has changed - and so must their approach to connectivity.